I was talking with my mother-in-law (who is eager to make some diet changes, yay!) about yogurt and probiotics and while I say making yogurt is easy, I have to admit for someone completely new to traditional cooking, it can be quite daunting. But that doesn’t mean you shouldn’t try it! I’m going to show you how to make the simplest of yogurts, no special equipment required. Yogurt is what happens when you add certain beneficial bacteria to milk and allow it to culture for a few hours to a day. The longer the fermentation period, the more sour it is. The bacteria eat the lactose so if left to culture long enough, all the lactose will be spent and those who are lactose intolerant should be able to enjoy yogurt without later regret. The yogurt that most of us is familiar from the store contains lactobacillius acidophilus and bifidobacteria and is cultured at 110F for just a few hours. But did you know there are many different kinds of yogurt? A yogurt from a different part of the world may contain different strains of bacteria and some do not need the higher temps of the store bought yogurt we are all familiar with. I use 3 different types of counter top yogurts: Villi, piima, and kefir. Viili and piima (yes, there are 2 i’s) originated in Scandinavia and cultures between 70-78F. they have thinner consistency that what you may be familiar with but it lends itself very nicely to smoothies and has a nice mild taste. I actually prefer their taste over store bought yogurt. Kiddo loves it with just a few drops of stevia to sweeten. 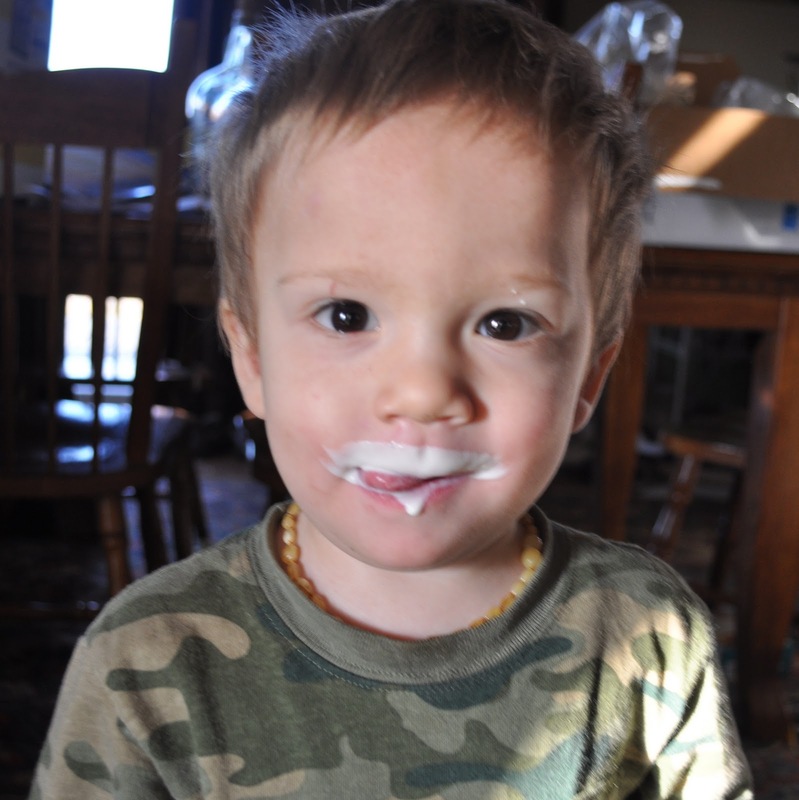 Now that’s a milk mustache! They are actually quite simple to make. No joke. To make either viili or piima, you simply gently mix in 1/4 cup of starter per 1 quart of milk, loosely cover and leave it alone for 12-24 hours. 24 hours will ensure all the lactose is eaten up. If you are using raw milk, you’ll want to maintain a special starter about once a week. I just warm up 1 quart of milk to 160F and then let it cool to room temperature and add 1/4 cup of starter from a previous batch. Raw milk contains bacteria and while it is good bacteria, it will contaminate the yogurt culture and you might get some funky results if you don’t maintain a pure starter. You can purchase viili and piima (and many other different yogurts) at Cultures for Health. 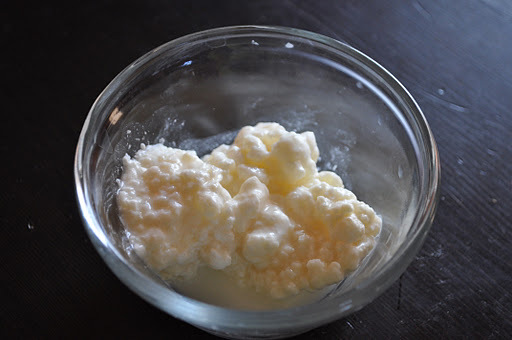 My favorite thing about kefir is not only the complexity of it but the simplicity of making it. Just drop the grains in a quart of milk and it does all the work. Come back the next day and you have kefir. Strain the kefir out (I just fish them out with a spoon and rinse them off gently) and add to a new quart of milk. My family goes through a quart a day easily but if you don’t need a quart every day, you can let your kefir rest by placing it in cold water or milk and refrigerating it for about a week. If you need to take a break from kefir, you can freeze it for a few months just fine. Kefir also multiplies so you can either just eat the extra or you can give some to a friend. To get your own kefir grains, if you don’t have a friend with some, Cultures for Health also carries kefir grains. Make your own sour cream! All three of these cultures also make the best sour cream. You’ll never need to buy sour cream again! Just add 1/4 cup piima, viili or kefir grains per quart (or 1 tbsp per cup) and let it set 12-24 hours. Be sure to use farm fresh cream if it’s available. If not, be sure to NOT use ultra-pasteurized cream. Only fresh or pasteurized works well. Oooh, you must try making butter out of this cultured cream. Super yumminess! Hmm, I may have to write a whole separate post for this goodie. How to use viili, piima and kefir? Our favorite way to eat yogurt is to just add a few drops of stevia or raw honey to sweeten and maybe a few drops of vanilla or orange extract. You can make a quick and easy smoothie by blending in some fresh juice (like Naked Juice) or frozen berries. I like the ratio of 2 parts yogurt, 1 part juice. It also gets used in place of buttermilk, yogurt and sour cream in recipes. Drip it for yogurt cheese, cream cheese or to use in Pumpkin Cheesecake. *Just a note. I do have an affiliation with Cultures for Health but have been recommending them long before the affiliation. I get all of my cultures from here and highly recommend them. I’d never recommend anything that I didn’t stand behind. This looks so great! I love yogurt and all related products but have never tried to make it myself. I've always been a little intimidated by the fact that yogurt needs to stay at a certain temperature to work. These look like a good way for me to start culturing milk without getting in over my head! I really appreciate all of the instruction and encouragement in this post, and I would definitely be interested to learn more about making cultured butter :)A quick question, I don't have any raw milk resources in my area but I do know that my cooperative grocery sells local milk in glass jars. As long as it's not "ultra" pasteurized (I'm sure it is somewhat pasteurized) do you think that would work? Thanks again! As long as it's not ultra-pasteurized, go for it. In fact, if you don't have access to raw milk, the best thing you can do is reintroduce good bacteria into the milk you can find. Before I found my real milk source, I just cultured the store bought milk.I'm glad you found this helpful! Can you clarify about how to make yogurt with raw milk? I am very confused about maintaining a good starter. Do you mean I make the yogurt using storebought yogurt (for my starter), and each time I consume and make a new batch, I save part of the yogurt. After about a weeks time I heat it as you instructed above? Sorry, I just need clarification. I greatly appreciate your site! It is super duper awesome.